Truth be told, I love a good ‘basic’ outfit. Skinny jeans, knee high leather boots, turtleneck sweater. It’s easy and always works. But I hate to feel boring when it comes to fashion, so I always try to incorporate one little signature touch to make an outfit feel unique. Adding a cluster of brooches to a jacket has long since been a favorite little style trick and I’m thrilled to see them making such a comeback this season. Talk to me in 3 months and I’ll say I hate coats of any kind, but the first time I put them on each year? I love ’em. The coziness, the way you can play with layers, the mix of textures. Suddenly a sundress and sandals just seems like a distant, boring notion. So when Banana Republic gave me the chance to pick out a fresh fall outerwear combo for the season, I hit ‘add to cart’ before you can say November. Thank goodness that winter weather from last week wasn’t here to stay (yet) and I’m able to sneak in a few more days of bare legs. Since I know that won’t last forever, I soaked up the weekend’s fall weather in this jacquard floral miniskirt and simple layers. Plus a velvet hair bow – because I can’t stop lately. On Sunday, Adam and I took advantage of a rare day without plans and took a drive out of the city. We ended up in the town of Warwick, New York after stopping at a nearby pumpkin patch/apple orchard – because apple cider donuts.. obviously. It feels like the trees have barely changed here in the city, so it was fun to see the all out explosion of color happening just an hour north of us. 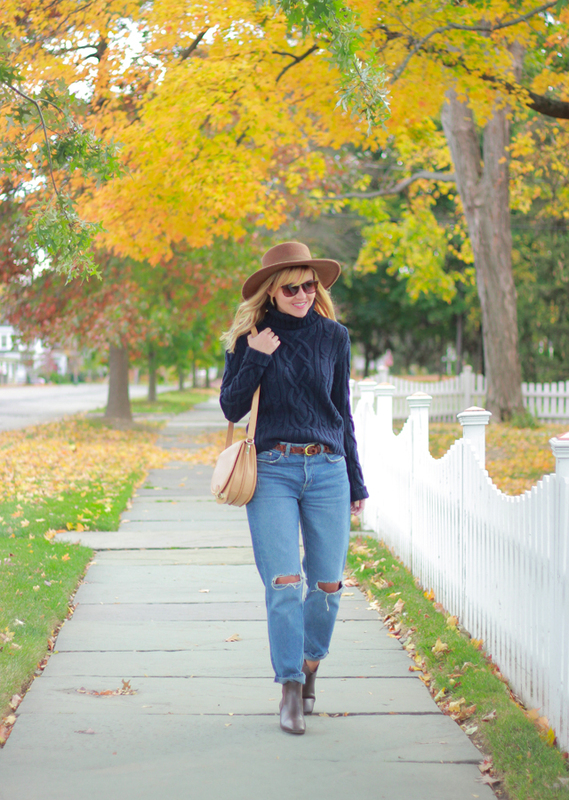 I picked up these boyfriend jeans (or ‘Mom jeans’ as Adam lovingly calls them..) earlier in the weekend and paired them with these slip-on ankle boots and cable knit turtleneck sweater that I got for our trip to Maine.